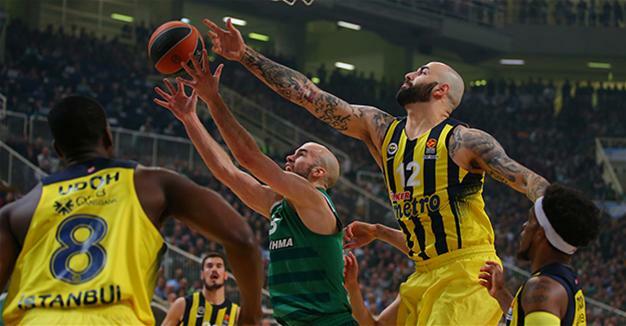 Buoyed by two sensational road wins last week, Istanbul’s Fenerbahçe could become the first team to advance to the EuroLeague Final Four by sweeping a best-of-five series at home when it hosts Panathinaikos on April 25. The Athenians scored the lowest number of points of all teams in the opening games, and will surely need more than its average of 66.5 points to keep the series alive. To do so, the Greens will have to improve its true shooting percentage of 42.6 percent, the worst of all playoffs teams. Conversely, nobody has been shooting more accurately than Fenerbahçe, which converted 54.5 percent of the points it attempted last week. Fenerbahçe toppled Panathinaikos 80-75 on April 18, with guard Bogdan Bogdanovic scoring 25 points, grabbing eight rebounds and dishing out six assists in the crucial game at the Nikos Galis Olympic Indoor Hall. Center Ekpe Udoh was also essential in the win, scoring 22 points and grabbing eight rebounds. Bobby Dixon also chipped in 14 points. CSKA Moscow can also advance to the final four with a road victory at Baskonia Vitoria Gasteiz on April 25. On April 19, Fener’s Istanbul rival, Anadolu Efes, beat another Greek giant, Olympiacos, in Piraeus, taking the series to 1-1 before returning to Istanbul. Turkey’s other entrant in the quarterfinals, Darüşşafaka Doğuş, beat Real Madrid in Spain to draw level with the giants ahead of Game 3 in Istanbul. Anadolu Efes and Darüşşafaka Doğuş will take the court for their respective tests on April 26.